Be the first to share your favorite memory, photo or story of Jamison. This memorial page is dedicated for family, friends and future generations to celebrate the life of their loved one. 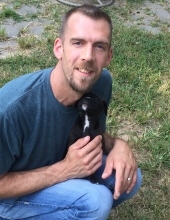 Jamison M Green, 38, of Platte City, went to be with his Lord on March 18, 2019. He was born on December 6, 1980 in North Kansas City. He was the beloved son of Ron and Pam Green and a much loved Daddy to Tatum, Sumer, Laci and Cali. Jami lived in Kansas City, then in Camden Point, he then married and moved to Dearborn to raise his family, finally settling in Platte City. Jami was self employed as a carpenter and he did custom woodworking. His hobbies included playing the banjo and guitar, reading, he wrote poetry, he enjoyed playing chess with his daughter, he loved cooking and teaching his girls how to make homemade cookies. Jami had a passion for collecting and refinishing antique rocking chairs. At one time Jami was an avid hunter and outdoorsman, skilled with both rifle and bow. Over time he decided that he much preferred enjoying nature and observing God's creatures rather than hunting them. Jami loved spending time with his girls, teaching them about life, woodworking, chess, and music, encouraging them to be good students and to go to college, planting good things and godly values into their hearts. One recent value he tried to live out and instill into them was, "If you don't know what to do, do something kind." It is with the heaviest of hearts and with tears of sorrow that we must somehow find a way to say our goodbyes to Jamison. We know that we will surely see you again in heaven, Jami, but right now there is such an immense hole left inside each one of us and heaven seems so very far away. Jami we hope you know how very much you were loved and how much you will be missed! We will always keep you in our hearts. Jamison is survived by his wife, Brandi Green, his four daughters Tatum, Sumer, Laci and Cali, his mother, Pam Green, his brother, Derek Green, his maternal grandmother, Pam (Rich) Hockett, his paternal grandmother, Beverly Green and also Mari Green, and numerous aunts, uncles, cousins, nieces and nephews. He left behind many good and trusted friends, as well. He is preceded in death by his father, Ronald Green, his uncle, Gary Hendricks, his maternal grandfather, George Hendricks, his paternal grandfather, Jerry Green and great grandparents Velma and James Lane, Ethel and Robert Hendricks, Irene and Andy Anderson, and Kitty and Hobert Green. A visitation service to celebrate Jami's life will be held at 4:30pm-6:30pm on Thursday, March 28th at the Souder Family Funeral Home. There will be a memorial service at 6pm, immediately following the visitation. Burial will be at Second Creek Cemetery on Friday, March 29nd at 10:30am for the immediate family and close friends who might wish to attend. In lieu of flowers, family is accepting donations to help with funeral expenses. A donation can be made directly to Souder Family Funeral Home, 1333 NE Barry Rd, Kansas City, MO 64155. To send flowers or a remembrance gift to the family of Jamison M Green, please visit our Tribute Store. "Email Address" would like to share the life celebration of Jamison M Green. Click on the "link" to go to share a favorite memory or leave a condolence message for the family.